To achieving a "borderless"enjoyment of sports, we started the company with full of passions and enthusiasm, for supporting sports man with professional wears and technological gears in all sports territory. You will get the full refund from LINKIN SPORT when you have any unsatisfied. The EP-Package edition without box packaging. Made of high-quality PU leather and heavy duty spring bounces, sturdy and durable. Dimensions: L 14" W 6" H 7.5", with strong suction cup and a free pump will inflate punching ball easily. Great game for relieves stresses, agilit and boxing exercise. If you have any questions about this product by Sports Linque, contact us by completing and submitting the form below. If you are looking for a specif part number, please include it with your message. Boxing Speed Ball with Hand Wraps. Reflex Fight Ball with Headband. Great for Boxing, MMA, Kickboxing, Muay Thai, Exercise, Training, Eye-Hand Coordination. Perfect for Men, Women and Kids. 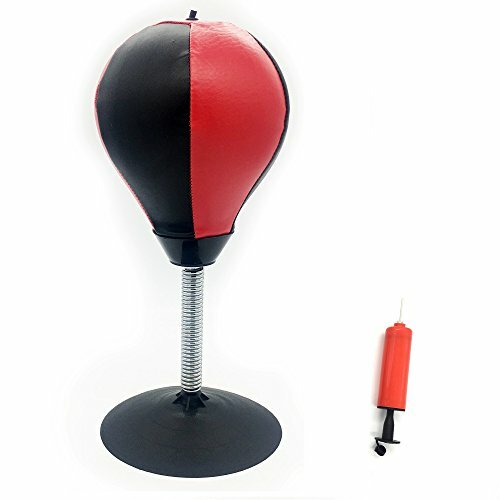 Fight Ball Reflex, Punch Exercise for Boxing, MMA and other combat sports.